3:00 PM and 8:00 PM at Tanghalang Nicanor Abelardo (CCP Main Theater). indigenous Filipino instruments in orchestral productions. 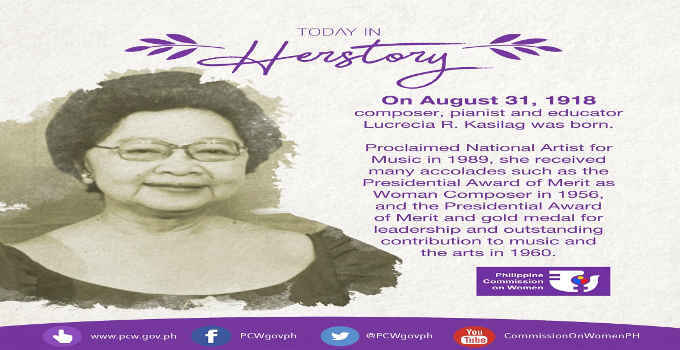 Prominent works of Tita King will be performed by the CCP resident companies – Philippine Philharmonic Orchestra under the baton of Maestro Herminigildo Ranera, Ballet Philippines, Bayanihan Philippine National Dance Company, and Philippine Madrigal Singers. Guest artists include violinist Gina Medina, pianists Jett Chong, Zenas Lozada, Joed Balsamao and Vincent Saavedra, PWU Indayog, PWU Vocal Ensemble, Kabataang Gitarista, and the UST Guitar Ensemble. The program also includes the special participation of Dr. Ramon P. Santos – National Artist for Music, Alice Reyes – National Artist for Dance, Fides Cuyugan Asensio, Suzie Moya Benitez and Gener Caringal. Gino Gonzales, with Meliton Roxas as lights designer and Joed Balsamo and Melissa Corazon Mantaring as program curators.